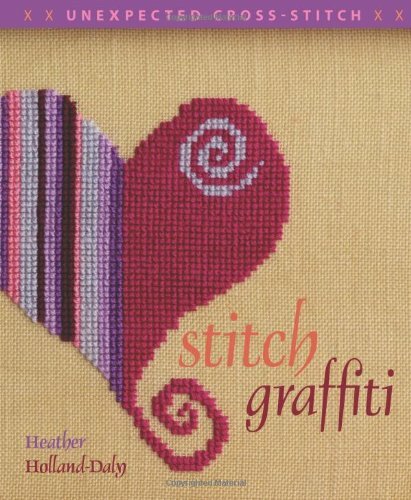 While there are many colorful and—yes—unexpected cross stitch patterns collected here, perhaps the most revolutionary thing about Heather Holland-Daly’s Stitch Graffiti: Unexpected Cross Stitch is that it has been published at all, and by the well-known craft publisher, Interweave Press, long the bastion of primarily high quality knitting titles. However, considering the recent reinvention of knitting as a hip, urban pastime, it’s not surprising that Interweave would take this project under their wing. Cross-stitch designs are still printed on gridded charts, but they have moved beyond the teddy bears and country look of the 1980s and the traditional samplers of alphabets and verses that have been passed down through the centuries. Although those patterns still have a place, it’s time to add new ideas. My goal is to bring a new generation of stitchers to the craft and to inspire stitchers of old to pick up a needle and stitch again! I intend to whet your stitching appetite and excite you to share it with a friend, who in turn will share it with another friend, and so on…. Not only are the designs unique and reminiscent of the colorful creations we’ve come to expect from Heather Holland-Daly’s design company, Monsterbubbles, the finishing techniques and display suggestions are unusual as well. Along with traditional types of framing where the stitched piece is centered in a square or rectangular frame with or without a matte, Holland-Daly offers cross stitch that is framed in sandwich frames, or on the diagonal, or extremely off-center. She also suggests looking for inspiration at your local craft store, hardware store, or swap meet for beads, buttons, paint, and rubber stamps to embellish your projects. You can even find unexpected inspiration around your own home: one of her patterns is stitched into the mesh of a store-bought make-up bag and another on the grid of a fly-swatter. The book opens with the seemingly obligatory section of basic cross stitch instruction, including a helpful mini-tutorial on using variegated floss, which many of the designs in the book call for. The book also offers many suggestions (displayed as faux Post-It notes) of songs to stitch by, many of which I have in my own music collection (make of that what you will). 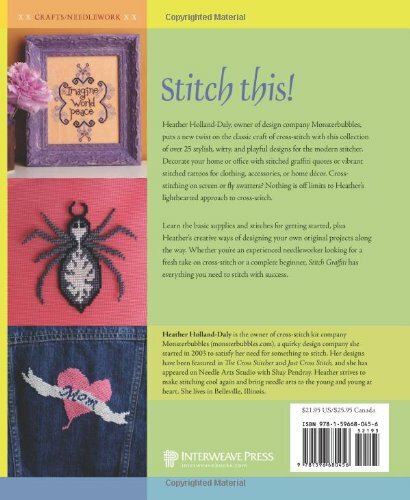 True to the mission statement of the book, these are contemporary songs, even songs from this century, although the selections, in my opinion, don’t push the envelope of style as far as Holland-Daly’s designs push the envelope of possibility for cross stitch design. If this sounds appealing to you, check out the Interweave Press site for the book and click on “See a preview online.” You’ll be able to view an extensive selection of patterns from the book so you can see if it’s your cup of tea. You can also purchase the book from that site or from Amazon (tell ‘em Kate sent you! ).